The key ingredients to a perfect family vacation are sun, surf, and maybe a rollercoaster thrown in for good measure. Panama City Beach has all three -- and plenty more. Surfers and beach bums have always loved the city, but a closer look reveals an incredible destination for eco-tourists, outdoor lovers, and families, too. 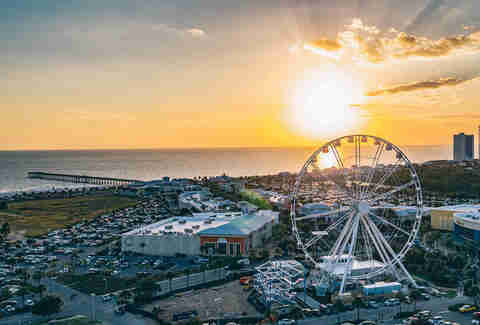 Now is the perfect time to start planning a summer getaway to remember with the whole family and PCB is the perfect location to put on your radar. With so many options for activities, there will certainly be something for everyone, whether you’re traveling with grandma, your kids, nieces and nephews, the family dog, or all of the above. And, to make planning as easy as possible, we put together the ultimate itinerary for your trip. If you’re looking to camp right next to the sand dunes, St. Andrews State Park is the perfect place to pitch your tent. Surrounded on all sides by clear water and pristine beaches, there’s an incredible view at every turn. Even if you’re not looking to camp out, the park offers low-key recreation, like fishing and swimming, as well as options for launching kayaks and renting out pontoon boats to explore the bay. If you are planning on staying overnight, keep in mind that campsites can’t be reserved in advance, so be sure to get there early enough to claim one. Shell Island is an undeveloped seven-mile stretch of land on the peninsula facing St. Andrews. Undeveloped means no concession stands, no restrooms, and no picnic tables… but it also means Shell Island is one of the best places to get some tranquility during your adventure-packed trip. Enjoy walking the sand dunes with your kids (or nieces and nephews) and keep an eye out for the wildlife that flourishes here, like sea turtles and ghost crabs. Shuttles can take you across the water right over to St. Andrews, so it’s easy to see both the bustling campground and peaceful wildlife sanctuary in one day. When we say “fun for the whole family,” we mean it. 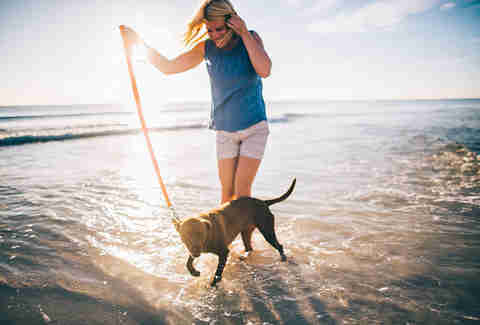 Take your ocean-loving pup to the Dog Beach, located at Pier Park, essentially PCB’s main drag. There are usually some other canines around, so expect your best friend to make some new friends, too. You’ll also find plenty of space for them to get their exercise, but dogs need to stay on-leash and be cleaned up after (stations provide convenient clean-up bags). Last, there is a three-dog maximum policy as well, so we can’t recommend bringing the whole sled team. Several restaurants surrounding the beach allow pets on their patios, so you can spend breakfast with Fido, too. Spending a whole day traipsing around gorgeous parks and playing beach volleyball burns a lot of energy, so be sure to start your morning off right with a good meal. Treat yourself to a stop-in at Thomas Donut and Snack Shop, a well-loved casual joint for both tourists and locals. 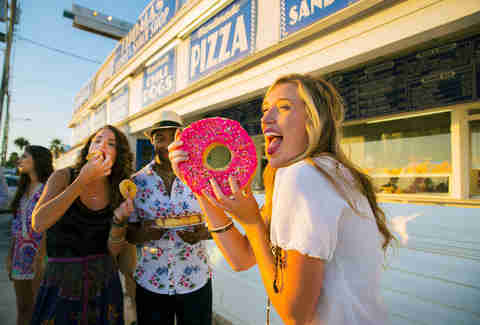 Regulars rave about their speciality doughnuts, including their buttermilk cake varieties, but they pack southern classics like biscuits and gravy and grits, too. With plenty of seating for a big family and an extensive menu, it’s perfect for a family visit. It’s the kind of place with freshly-made sweets and plenty of easy lunch options too, so you’ll be in for a good meal no matter what time of day you go. If your family is made up of adults or older kids, PCB’s waters are turquoise and perfect for diving -- but that’s not the only reason to go out for an underwater excursion. 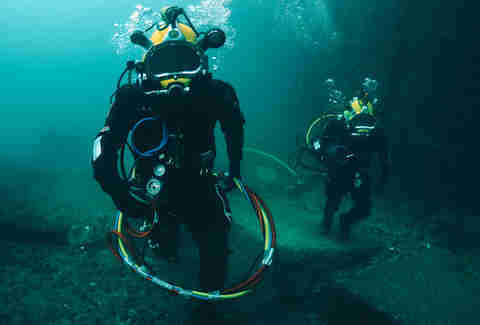 The area is known as the “Wreck Diving Capital of the South,” and, as part of their artificial reefs program, five decommissioned ships have been sunk off the shores of PCB, giving divers the opportunity to explore true sunken shipwrecks. These include a pair of tugboats, a WWII warship, and an oilfield supply ship named The Black Bart. There’s no buried treasure, sadly, but being able to see the marine life that have made homes of the wrecks is pretty close second to gold doubloons. Keep in mind that most dive charters require divers to be at least 10 years old, but snorkeling is an option for younger divers, too. 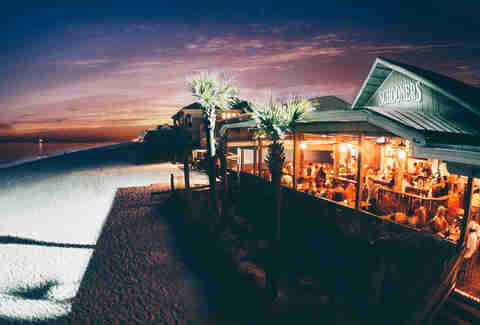 It’s called Panama City Beach for a reason, and you’re definitely going to want to block off enough time to explore the long stretches of beach outside of the state parks. 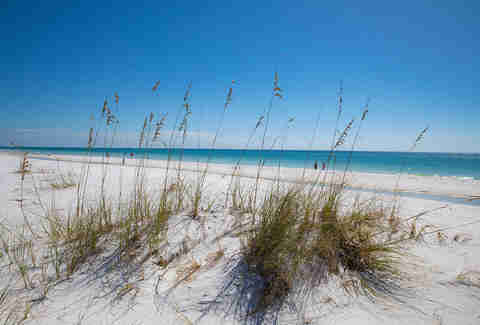 There are 27 miles of white-sand beaches, each stretch of which has a slightly different vibe and view. Plus, with 320 days of sunshine every year, you’re basically guaranteed a sunny day at the beach. For those traveling with kids who want extra peace of mind, stick to the sections near the city pier, as they’ll have a dedicated lifeguard staff patrolling during the day. Plus, they’ve got 11 volleyball courts if you want to challenge your family to see who has dishes that night. Is it really a trip to Florida if you don’t see some gators? Start with Airboat Adventures, where you’ll get the opportunity to meet alligators at their sanctuary and see all different ages of lizard, from just-hatched babies to fully grown behemoths. After the lesson, you’ll be taken out on an airboat ride to explore the marshes, hopefully spotting some wild gators in the process. Sure, you might learn a thing or two, but even if you’re not interested in gator facts, flying through the marshes is sure to please any crowd. Gators certainly aren’t the only opportunity for wildlife interactions at PCB. If you’re looking for a more interactive animal experience, try Zoo World Conservatory. They give you the chance to feed animals that are a little more cuddly, like giraffes and exotic birds. (You can feed gators here, too, if you want to watch their infamous death roll.) Plus, for $35, you can pet a sloth or a lemur, too. That means you’re sure to find an animal that suits everyone’s energy. Beyond that, Panama City Beach is also home to the largest natural population of bottlenose dolphins in the world, so you could take the whole family on a tour to see a few before the sunsets, too. If you thought the beachfront views were good, try being 200 feet above the city. 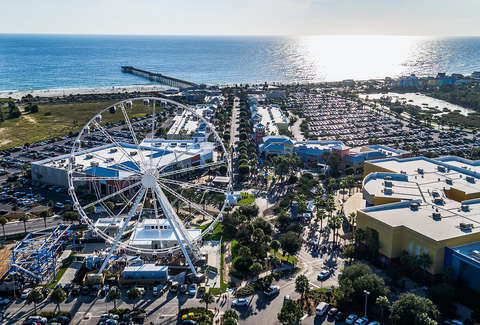 Skywheel is PCB’s massive Ferris wheel, from which you’ll be able to see for miles due to the flat topography. It’s a great experience to do at night or sunset, but there really is no wrong time of day to see the beaches from above. If you’re looking for a more adrenaline-packed trip, you could always head over to Race City, which features a rollercoaster and go-kart tracks. Plus they have the “Skycoaster,” which brings you 137 feet in the air before dropping you. Schooners, which calls itself the “last local beach club,” really does feel like a neighborhood surf bar. Their patio deck is literally right on the beach, so they’re perfect if you need a quick place to hide from the sun and grab a drink during the day, or to watch the sunset at night. While definitely kid-friendly with a separate menu for under-12s, they also have a full selection of drinks, brunch options, and even late-night bar food. Live bands usually set the vibe at night, so it’s easy to get on Island Time. Maybe snorkeling shipwrecks spoke to something deep inside you, and now you have an unquenchable thirst for all things pirate. Well, you’re in luck, because you can hop aboard the Sea Dragon Pirate Cruise and sail the gulf with Captain “Fearless” Phil. Sunset cruises start at 5pm and hit all the major landmarks -- if you’re lucky, you’ll spot a school of bottlenose dolphins swimming alongside. 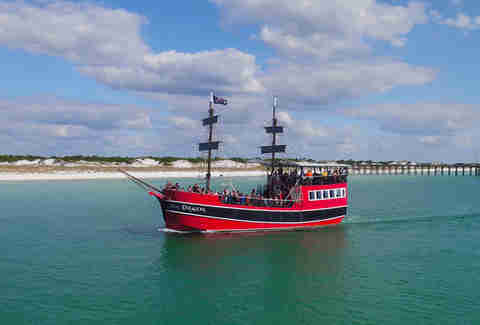 It’s just like a real pirate ship, minus the risk of a hostile takeover, and you and the kids will be talking like pirates for the rest of the trip. Nothing cures a sunburn like ice cream. (Ok, maybe get some aloe, too, but a sweet treat can’t hurt.) Pink Pelican is the go-to choice for scoops in PCB, especially since they go crazy with the flavors. In this old-school setting, grab a waffle cone with Chocolate Hurricane or Circus (cotton candy with gummy bears! )-flavored ice cream and enjoy. If you want to get adventurous, try the Dylan's Cookie Monster Delight, a sundae of cookie monster ice cream, with crumbled cookie pieces and hot fudge. They’re open till 11, so you’ve got plenty of time after dinner to grab a cone.